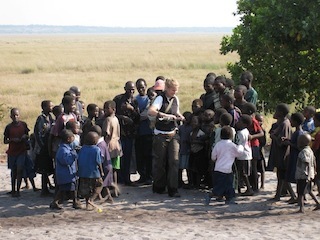 She currently holds the post of Trapnell Fellow in African Environments with the Environmental Change Institute, taking up a National Geographic Global Exploration Award to undertake new research on long-term environmental change in the remote Makgadikgadi salt pans in northern Botswana. She is also deputy director of the Oxford Luminescence Dating Laboratory and leads a number of projects which seek to improve the accuracy and applicability of Optically Stimulated Luminescence (OSL) in research on long-term environmental change. The Makgadigadki saltpans, located in Botswana in the middle Kalahari, occupy a basin once filled by one of Africa’s largest lakes. Evidence suggests that the lake has come and gone on several occasions during the last 200 thousand years. This research examines the potential of sediment cores, drilled from the lake bed, to reconstruct rainfall patterns and ecosystem responses in central Southern Africa, a region which lacks good records on past climate conditions. The overarching aim of the project is to test theories of long-term climate dynamics on the African continent. This research seeks to understand long-term environmental change in Zambia’s remote western province of Barotseland. We use fossil pollen, charcoal analyses and landscape dynamics to unpick the relationship between ecosystem change and landscape instability, identifying environmental extremes and baselines relevant for human populations past and present. Thomas, D.S.G. and Burrough, S.L. (2012) Interpreting geoproxies of late Quaternary climate change in African drylands: implications for understanding environmental change and early human behaviour. Quaternary International, 253: 5-17. Thomas, D.S.G., Burrough, S.L. and Parker, A.G. (2012) Extreme events as drivers of early human behaviour in Africa? The case for variability, not catastrophic drought. Journal of Quaternary Science, 27(1): 7-12. Telfer, M.W., Bailey, R.M., Burrough, S.L., Stone, A.E.C., Thomas, D.S.G. and Wiggs, G.S.F. (2010)Understanding linear dune chronologies: Insights from a simple accumulation model. Geomorphology, 120(3-4): 195-208.